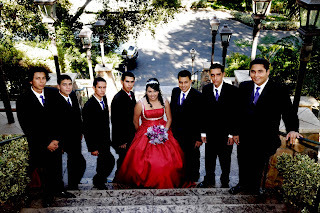 Quinceañera, Fiesta Quinceañera, or purely Quinces is the celebration of a girl’s fifteenth birthday in Latin America and other communities of immigrants from Latin America. This birthday is most special to these Hispanic families as it symbolizes the change from childhood to a young woman. I just love this young lady. 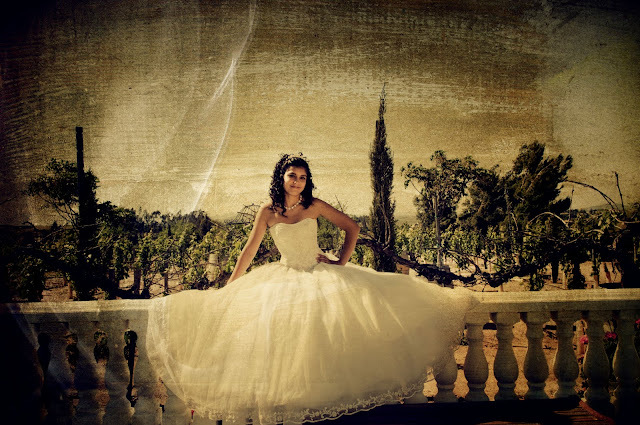 We went a week before her Quinceañera to take premiere photos of Julia at the gorgeous Mount Palomar Winery in Temecula, California. 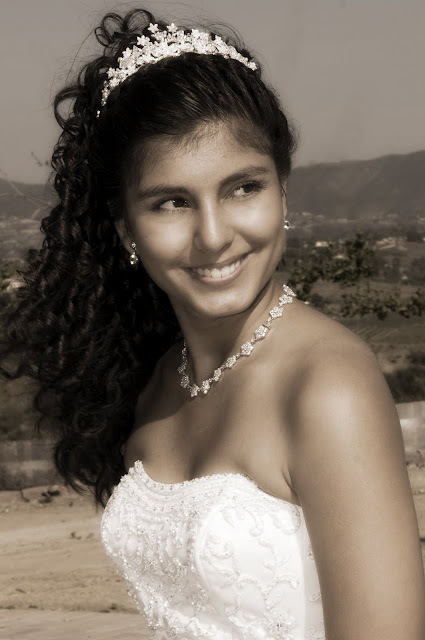 What a beautiful location for photos with a 360 degree view of the ranches and wineries in the Temecula Valley. Julia is so graceful and full of life. 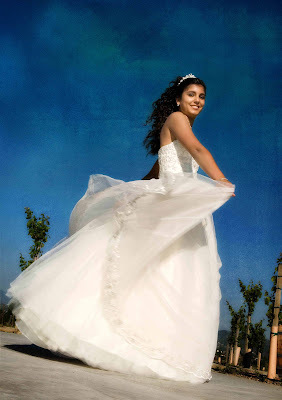 She danced around Mount Palomar Winery as if she had lived on the premises! Cute! Julia has such a sweet smile, pure innocence, pure heart. Julia takes a few moments to pray to the Virgin Mary, a statue representing the Mother of Jesus at Mount Palomar Winery. This is an important tradition for the Quince Girl in the Catholic Religion. 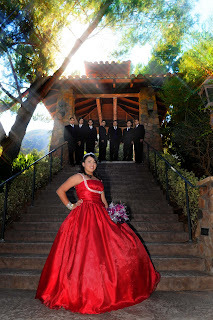 Julia is having so much fun with her family and friends at her Quinceañera at the Canyon Crest Golf Club in Riverside, California. It’s so nice to see the kids having so much fun at this young age. In Argentina (the birth land of my mother), Paraguay and Uruguay it is only referred to as a fiesta de quince. This fiesta commences with the arrival of the birthday girl, donning her special dress, and escorted by her papa. The Quince girl and father make their entry at the sound of music, while friends and relatives customarily give the father flowers. Then the ceremony begins, in which the girl dances with all her friends and relatives. The ball is usually divided into segments, between which various dishes are served. A typical program goes as follows: Grand Entrance, Waltz, Entrée, first period of dancing, main meal course; second stage dance, dessert and video playback of the recorded birthday with her friends, 15-candle ceremony (beautiful but lengthy, see below); third period of dancing, Toast, Cake, and a ritual where each female friend/relative pulls a ribbon out of a bunch. The ribbons all have charms on the ends except for one which has a ring, Carnival-style dance (oh yea!). In this ceremony the birthday girl delivers fifteen candles to people who she believes were most momentous in her development during her fifteen years. The lighting of the candles is usually accompanied by a short speech dedicated to each of the people that are given candles. The 15 candles symbolize the 15 years the girl has “left behind”. Each candle symbolizes a special memory, a moment shared by that specific person who is invited to join the ritual. This is not a typical ceremony in the United States, but I was fortunate to have shot a Quinceañera presenting this rite….very moving. In Mexico, the birthday girl is made-up with fancy make-up. This used to be the first time she would wear makeup, but no longer seems to be. Her nails and hair done especially for this occasion and dresses with an ornamental dress that she has dreamed of wearing for many years. 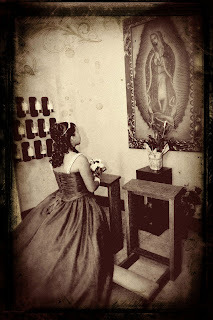 In the Mexican tradition – and if the quinceañera is Catholic – the quinceañera festival begins with a Thanksgiving mass. 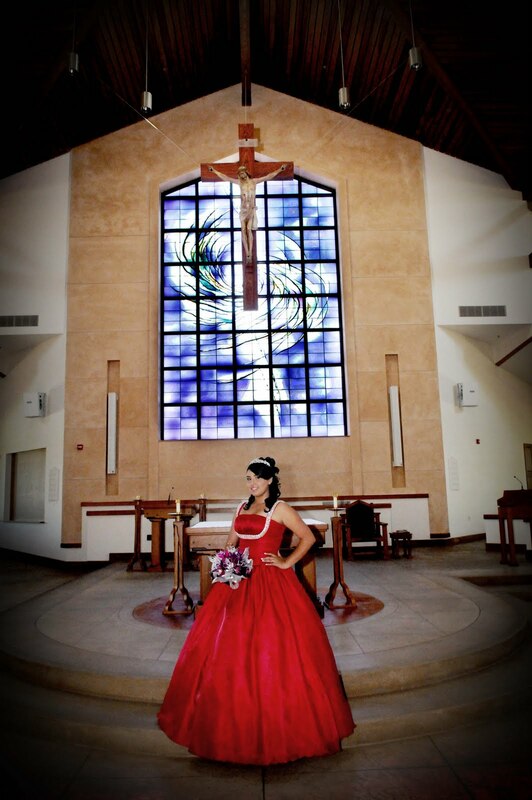 The quinceañera comes to church dressed in princess style formal dress. 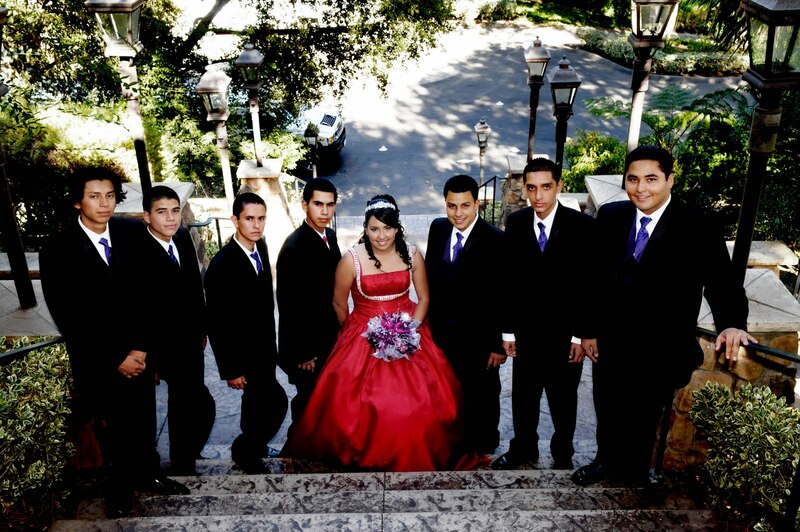 Usual tradition calls the quinceañera to wear a pink dress to symbolize her purity; although, recently white has become the color of choice to symbolize this treasured quality. Sometimes her white dress is splashed with touches of color mirroring her sense of style. She arrives at the church with her parents, godparents, and chamberlains. At this mass, a rosary or a necklace with a locket or pendant with the image of Mexico’s Virgin of Guadalupe, is given to the by her Godparents. 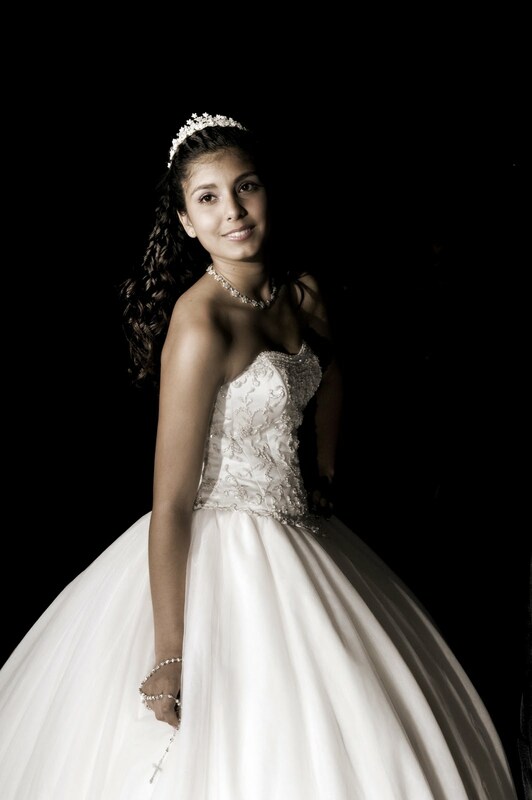 The quinceañera wears a tiara as a reminder that to her loved ones she will always be a princess. 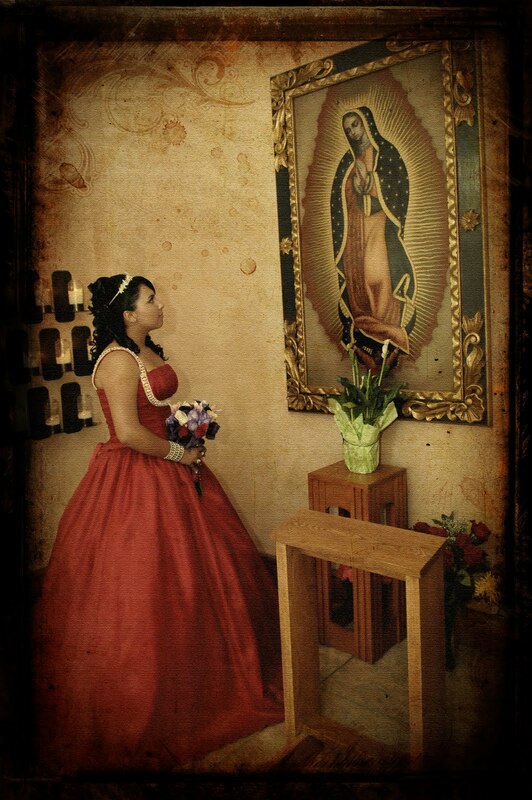 After this, the quinceañera leaves her bouquet of flowers on the altar to the Virgin Mary. After the Thanksgiving mass, the family and friends of the Quince girl come together for a celebration party giving her gifts. The party may take place at the birthday girl’s house, on the street (known as a tocada), or at a banquet hall. At the party, the Quince girl usually dances a waltz with her chambelanes. The waltz is usually choreographed for weeks in advance. There are generally six parts in the party: formal entry, toast, short speeches by the girl’s parents and or godparents, waltz with the chambelanes (chambelanes take turns dancing with the birthday girl during this first dance of the night), family waltz with the immediate relatives and closest friends of the birthday girl, general waltz where everyone dances. Mexican girls cannot dance in public until they are fifteen except at school dances or at family events. 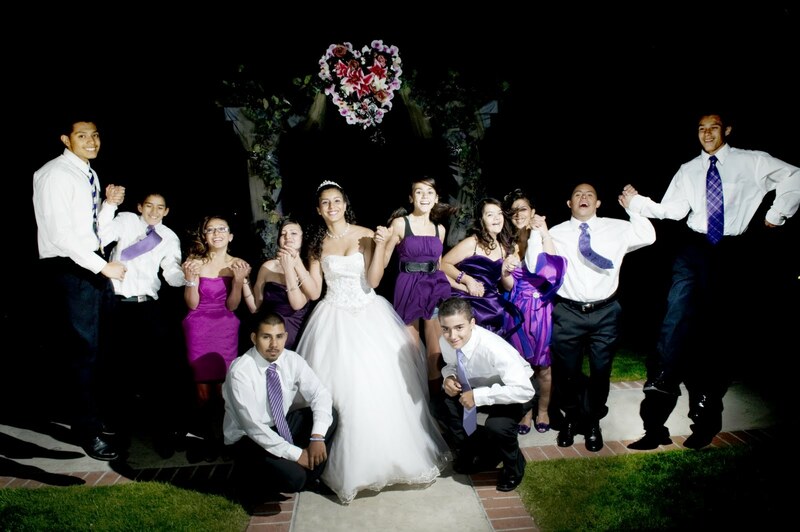 The quinceañera waltz with the chambelanes is the first time the Quince girl ever dances in public. Sometimes there are other rituals such as the ceremony of the last doll (“La Ultima Muñeca”). This custom based on a Mayan Indian tradition and it is related to the birthday girl’s favorite childhood doll. It makes reference to the last such toy in her life since, after the quinceañera event; the Quince Niña becomes closer to age of marriage. Your wedding is a reflection of the unique romance that inspired it—from the finest details to the grandest gestures, your celebration is an invitation to share the happiness of your love story. 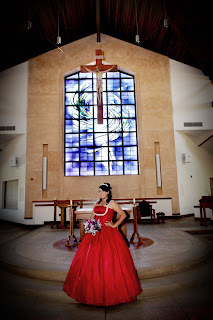 Let Bella Mia Foto capture your love story to share these cherished moments that last a lifetime.